If I asked you about your dream therapy website, you would probably tell me a lot of different things. You might say you want your website to look clean and professional, yet reflect your unique personality. You might say you want your website to teach clients about you and your background, or offer information on the different conditions that you treat. 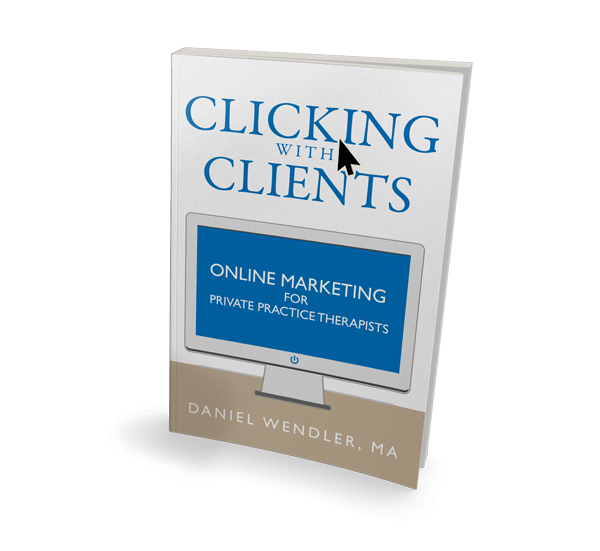 Your website should get clients to book their first session with you. Everything else is secondary to that goal. See, here’s the thing. When a prospective client comes to your website, they don’t want to look at a fancy website. They don’t want to learn about your therapeutic orientation. They want to get help with their problem. So your website’s job is to direct them to book a therapy session with you, because therapy is where they’ll find the help they are looking for. Everything on your website needs to support that goal. That means that with each element of your website, you should ask “Would this help encourage a client to book their first session?” and “Would this distract a client from booking their first session?” If the answer is “No” to the first question or “Yes” to the first question, then you should fix it. Of course, your website shouldn’t consist solely of a big button that says “Book a session now!” Clients usually want to learn something about you before they book their first session. So it’s a good idea to have information about your professional background and the services you offer. You can even include a blog or some videos, because that gives clients the opportunity to see your personality demonstrated and see if they would fit you. But you need to keep the main thing the main thing. Everything else on the site — your biography, your blog, etc — should be leading a client towards the decision to book their first session. Here’s the best practices we’ll be discussing. I’ll explain each one in turn, but I wanted to give you the summary first. “The fold” is the part of your website that is visible without the user scrolling down. Users spend 80% of their time looking at the content above the fold, so you need to grab their attention right away. A perfect example is Front Range Counseling. As soon as you load the page, you see a few paragraphs that summarize what they offer, a photo of a happy family, and a big “contact us” button. I guarantee that many people who visit this website end up becoming clients. Here’s an example of someone who is doing this well — Dr. Keely Kolmes. As soon as you load her page, you see a photo of her, a short summary of what she does, her contact information, and a button you can use to subscribe to her mailing list. Within the first six seconds of you landing on her page, you already have a decent sense of who she is and what you should do next. Another great example is Thriveworks. They’ve got a video that immediately attracts your attention and tells you about what they offer, and then they have a form you can fill out to set up an appointment. Austin Therapy for Girls is another good example. They have an attractive photo, a quick summary of what they offer, and a “learn more” link that takes you to a page where you can book an appointment. Unfortunately, there are a few bad examples as well. For instance, Elizabeth O’Brien dedicates almost the entire area above the fold to a photo of a flower. It’s a nice flower, to be sure, but there is much better use of that space. It would be much better if she brought her biography up from below the fold and made it the first thing that visitors saw. Nobody wants to squint to read your website. Make your font size 16px or so. If you’re not sure what that means, just make it bigger than the default. This goes for your menu too — make it big! Downtown Seattle Counseling has a tiny font size. My Chicago Counselor has a nice big font size. Which website would you rather read? And it’s not just about readability. It’s also about the image that you present as a counselor. If your font size is cold and people have to squint to read it, it makes your website feel unfriendly and unwelcoming — and that means people might feel that you as a therapist are unfriendly and unwelcoming. Seriously. Hire a professional photographer to get a headshot. Don’t use your iPhone and don’t grab an old vacation photo from Facebook. Hire a pro. Then put your photo on your site! Ideally, you should stick it above the fold so people can form a connection with you right away. But it’s fine to put the photo on your about page as well. Just make sure it’s professional quality. Also, think twice before you use stock photography. People are likely to connect with a genuine photo of you or your office. A stock photo of a random person? Not so much. People use the internet on their mobile devices more than on their computers. So it’s essential that your website is mobile-friendly. Fortunately, this is pretty simple to do. The web-speak term for a mobile-friendly website is “responsive.” So you need to make sure that whatever theme, template, or software you use to build your website, it’s responsive. 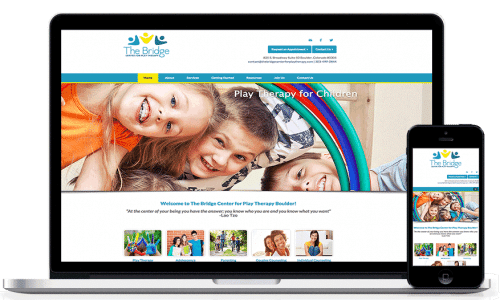 For instance, if you’re building your website in WordPress, you need to pick a theme. When you find a good theme, look at the description and make sure they say it’s “responsive.” If it is, you’re good to go. The WordPress themes I recommend both describe themselves as responsive. Just don’t do it. Are your clients really going to go on Facebook and say “Hey guys, check out this great therapist I found?” It’s fine to discreetly link to your own social media profiles, but you should never have the buttons that encourage visitors to share the page. A “carousel” in website-talk is when you have a space on your website that multiple pieces of content (usually images) rotate through. It’s a very bad idea. Check out Newman Clinical Associates. Their entire space above the fold is taken up with their carousel. The problem? Before you can finish reading one carousel image, it goes away (in a blinding white flash), and the next carousel image loads. It’s a bad way to read the information. Plus, the information that comes later in the carousel is often missed. Their carousel has a slide about intern supervision, but it doesn’t show up right away. I’m guessing most interns that come to this website looking for supervision will quickly scan the menu and decide there is no supervision available, then leave before the carousel even gets to the slide about supervision. Bottom line: Don’t use carousels. If you must use carousels, at least set them so that they don’t automatically scroll — but really, you should never use carousels. A core piece of your online marketing toolbox is the venerable “call-to-action.” A call-to-action is where you encourage the client to take some action that is valuable for you (like contacting you or booking their first appointment) and then provide them with a really easy way to take that action (like adding a big button that takes them to your contact form or scheduling system.) For instance, you might say “I’m ready to help – contact me today for a free 20-minute consultation” and then include a link to your contact form. You can also experiment with including multiple calls-to-action. It can be really powerful to have an initial call to action above the fold for someone who lands on your page and is ready to sign up immediately, and then have a second call-to-action at the end of the page for people who needed some time to read through your content first. A few images go a long way towards grabbing your readers’ attention. They make your writing look more professional and (more importantly) they help you fight against the constant temptation to click away. So add photos in to your writing. You might include one photo at the top of the article, or sprinkle smaller photos throughout the page. How do you find images? Well, you need to be careful, because most of the photos you find on Google Images are copyright protected. While it’s unlikely you’ll be caught, you want to be ethical. So it’s important to use images that are legally free for anyone to use. The easiest way is to use a site like Pixabay.com or Unsplash.com. Both sites allow you to search a big collection of totally free images. If you need more, Google for “attribution free images” or do some research on finding Creative Commons images. Look for images that relate to what you’re writing about. The connection doesn’t need to be very strong – if you’re going to write an article about mindfulness exercises, you don’t actually need a photo of a therapist teaching someone mindfulness. You could just have a photo of a calm nature scene, or a relaxed person, or something like that. Pick images that are appealing to look at. This means that you should choose photos that are high-resolution, not blurry, etc. But this also means that you should avoid images that are shocking or upsetting. If you want to write a post about self-harm, don’t include a photo of someone’s self-harm injury! Try to create a theme. While you don’t need to have identical images on each page, it’s ideal if your images are on similar topics, or have a similar visual feel. For instance, you might try to have lots of nature images, or lots of images in the same art style. Your clients probably don’t know what a therapeutic orientation is and they probably don’t care. However, they probably do want to know if you’re going to give them lots of advice or if you’re mainly going to listen. They’re probably want to know if you’ll be digging into their emotions or focusing more on changing their behavior. So tell them those things. Instead of giving them a lesson on your theoretical orientation, tell them what therapy with you will be like. Don’t get philosophical or pie-in-the-sky; focus on the real questions that your clients will be having. Theoretical orientation is just one example of areas where psychobabble can creep in. Use the same kind of thinking when talking about anything else where you might be tempted to use psychobabble. Of course, it’s fine to use psychobabble if the intended audience is other professionals (for instance, if you anticipate other therapists visiting your website so they can refer clients to you, or other psychologists visiting your website to learn about your research.) But if that’s the case, have a separate page on your site called “For Professionals”, and keep the main area of your website focused on the clients. Kristin Lanning is a good example of someone who does this well. If it’s unclear how to book a session, many clients will leave your website without contacting you. So make it really, really easy for clients to book a session with you. Louis Laves-Webb does a great job with this — they have a bar at the top of their site with information on how to book a session, and their home page has a big button that says “Book a session now!” However, you don’t have to get fancy. A big button in your top menu that says “Book a session” should do the trick. Similarly, you need to make it obvious what your fees are. Have a page in your menu that says “Fees” or “Rates” or “Insurance & Fees” or something like that. Don’t make people dig to find out whether or not they can afford you. Get feedback from a lot of people on your website. And don’t just show it to them and ask “What do you think?” because you don’t want flattery. Instead, ask them specific questions. Ask them things like “If you were a client, what would make you choose me as a therapist, or pass on me as a therapist?” Ask them to imagine they are a particular kind of client (for instance, a client with depression, a low-income client, an elderly client) and see how well that client would be served by your website. Offer to buy them lunch for every problem they find that you can fix. Thanks for sticking with me. Remember — when in doubt, just follow the golden rule and ask yourself “Is this part of my website encouraging people to book a session with me?” If you’re still in doubt, ask a friend to use your website and give you their honest feedback. Also, remember that you don’t have to go it alone. I’m available to help with your web design, so if you’re feeling overwhelmed, just drop me a line and we’ll improve your website together.